As a consultant who dances on a narrow bridge between Regulatory and Industry, with education as a balancing pole for seventeen years, I love this profession. I was therefore disappointed in the Keynote -- there was too much silence in what was said. While I was crawling all over the floor shooting the pictures in the post above, two voices were suspiciously silent up at that podium. We heard from government at all levels and from associations of government officials. I heard no one from Education up there at the podium. There was of course one Educator who got up first with her comments. She should have been up there at the podium, not down at the comment mike. The question of environmental health’s identity and future cannot be answered by only one core constituency. If we are in the crisis of ED as discussed during the keynote, it may not need pills but passion. When one note is sounded too much it’s not a key note, but monotonous. When a vision is monochromatic and grey, it fails to be seen. Educators and industry are present at the NEHA AEC, yet we are still a silent minority much of the time. If we create a vision which integrates EH professionals in Industry and Education instead of making them separate-but-equal partners to regulatory, we bring even greater insight from very different perspectives. If we increase the palette, we can render our vision for Environmental Health more colorful and more attractive. Much of the discussion referred to EPA. At one point the difference in the agencies was summarized by stating EPA was an agency run by lawyers, while CDC an agency run by doctors. In my view the difference between environmental protection and environmental health is environmental protection protects the planet from us, while environmental health protects us from the planet. That is of course simplistic, and the number of times one affects the other are countless on this planet. Environmental protection does do some environmental health, as well as we do some environmental protection. But the biggest thing we can take from EPA is not tax dollars, but something far more valuable. Deep in the heart of EPA is not just a profession, but a movement. Its success integrating diverse elements at its inception stems from the ecological movement. Otherwise it never would have been created. We need to make environmental health a cause not only for our profession, but for all the people we protect with our efforts. The crisis which can create a movement is certainly there, with tomatoes only the latest chapter in that crisis. Environmental health professionals need to drive that movement, lest elements of the uninformed public drive it for us. This will need an integrated industry, educational and regulatory vision to work. It will require each of us to personally believe in a vision that we are the men and women who protect the people of our community from the dangers, lurking in the environment. In my view, one open to lively debate, we need to reclaim our ancient role from the times before science. As young as we think EH is, it is also older than medicine. EH was the role of the Shaman, prophet and priest. They may have used magic, but we can use technology. They may have called them demons; we call them pathogens and toxic substances. Both they and we ward off disease that came from the environment around us. Who we need to be and the path we need to tread is to reclaim that ancient heritage. We no longer need to be the invisible profession, nor the orphans of public health. We need to be those who protect the orphan; we need to be the prophets of public health. Michele was clearly very passionate about the subject of Emergency Preparedness and committed to getting the "message" out. And she shared her experiences for doing it on a shoestring! In rapid-fire and animated presentation, Michele reviewed a number of agencies, information sources and web sites that provided resources on emergency response and health education at NO COST. She stressed the need to be flexible and innovative in promoting the preparedness message - adapting and piggybacking on the topic du jour. An interesting example how they conducted a Pandemic exercise as part of a mobile Flu Clinic. Michele provided a wealth of information, and some excellent examples of how to implement processes with almost no budget. As this is a common situation for most of us, the presentation (available on the Conference CD) is a valuable resource. A short biography of Joseph Lister. Over at Microbiology Bytes, AJ Cann has a short but very informative podcast Biography of Joseph Lister, arguably the man who pioneered preventing cross contamination and the man Listeria monocytogenes is named for. I attended the lecture on “Predicting Foodborne Outbreaks at Restaurants: Results of a Risk Assessment Model” presented by Heidi Sato. This was a VERY popular presentation as they brought in a lot more chairs and there were still more people standing in the hall outside the room. Heidi presented the results of a research project she conducted with the LA County Health Department that involved reviewing violations observed in restaurants that were involved in foodborne illness outbreaks, and then comparing risk factors between those restaurants and selected restaurants that were NOT associated with outbreaks (Case – Control). Normally a review of Odds Ratios, Confidence Intervals and Statistical Significance would be pretty dry, but the subject matter was obviously of great interest to those in attendance. While standard factors of food safety (type of foods served, extent of preparation, etc.) showed up as predictors, some other – more unusual - factors seemed to play a greater role in outbreaks. Factors like Ownership Type (Corporate versus Franchise versus Private), Entrée Price and Number of Customers seemed to be better predictors of outbreaks than the food safety issues. Using structured equation modeling, Heidi found that the factors of Number of Customers (0.33), Critical Violations During Inspections (0.21) and Use of Raw Foods (0.15) were the strongest predictors of involvement in a foodborne illness outbreak. There were quite a few questions at the conclusion of the presentation, as it seemed that people were trying to relate the information with their own experiences. As with most research, the statistical details of this presentation will need to be interpreted so as to be useful in the field – there was a lot of information to digest and a lot of work will be needed to determine how it can be integrated into our daily activities and programs. A very interesting presentation. As one gets into blogging more, it becomes helpful to leave live links in a comment or post. While most text editors will take care of posts, this is not the case for most comments, which are primarily straight text. Yet most commenting dialog boxes like the one here for blogger allow the use of some of the most common HTML tags in order to allow for some formatting of a comment. There are three primary HTML tags you might use <b>, <i>, and <a>. Each of these tags allows you to control the formatting of your text in your comment, which can be very useful. I’m not going to teach everything about HTML here just some very simple basics so you can use these three in comments. HTML tags are a lot like (parentheses) or “quote marks,” you need a starting mark and an ending mark, and then they do something to your text. The way we make an ending mark is to take a starting mark and add a slash to it. So the mark <b> is completed with </b> for example. Always use a beginning tag and an ending tag, other wise you will get very unexpected results, if the comment page will even let you send it. I’m gonna make a bold statement. Italic works the same way, with the <i> and </i> tags. This does require a lot more typing and you do need to be very careful for typos, but it makes it one step easier for someone to get to the site you want them to visit, and that in turn increases visits. Any questions please leave comments below. Also try this out in the comments for this post. The worse you can do is get an error message from the blogging software. There is an idea in the world of advertising called the high concept. Heath and Heath in their book Made to Stick note that high concepts are among the best examples of core and compact ideas. They convey a lot of information in a few words. High concepts are often used to convey an entire plot of a movie or project in five words or less. High concepts usually used a word heavily laden with meaning the listener already has and then qualifies that meaningful idea with one more idea. One of my favorite old cartoons Inspector Gadget could have a high concept of “Get Smart for kids” for example. Get Smart itself might be described as “James Bond as a idiot.” High concepts also can become an important way of unifying people within an organization to a singular vision. As Heath and Heath give the example “the low cost airline” is not just a slogan for Southwest Airlines but their entire philosophy for doing business. I’ll be talking more about high concepts in my storytelling learning laboratory session Monday afternoon at the NEHA AEC in Tucson, and why they are so useful to storytellers in EH. But the NEHA meeting has a theme struck by the Keynote Who are We and What do We Want to Be? In the Keynote, we will be talking some specifics. I’m interested in the Who are we? question in terms of high concepts. What could be some high concepts describing the identity of Environmental Health Practitioners? What high concept could unify our vision of EH? So let’s brainstorm a few! Leave a comment below of your high concept. Keep it to less than ten words. Don’t explain yourself. If you want, you can comment on other people’s ideas. Ladies and Gentlemen, start writing those high concepts! 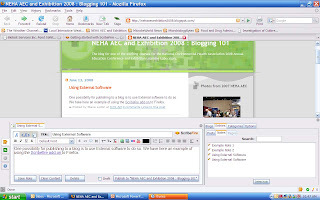 One possibility for publishing to a blog is to use External software to do so. We have here an example of using the Scribefire add-on to Firefox. Blogging is remembering everything you did before.